And its star wars so of course I had to do multiple projects. 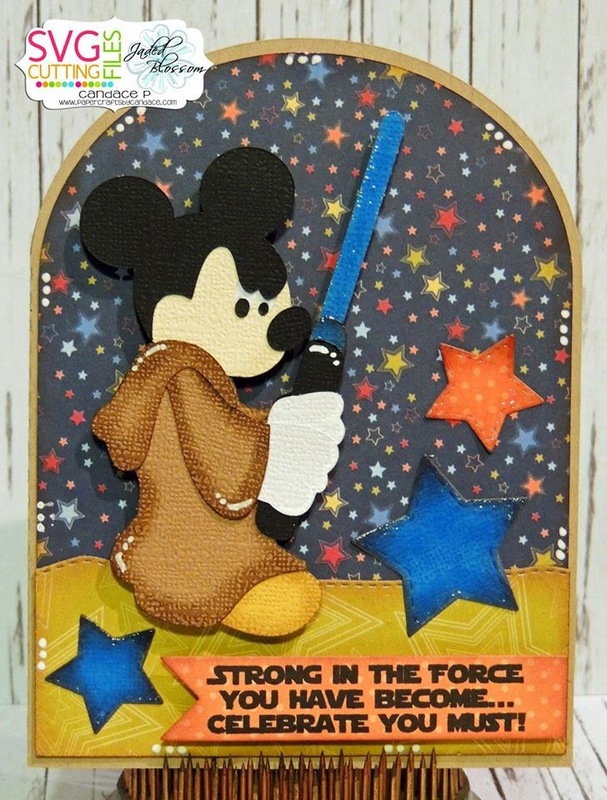 My second card.. Jedi Mickey!! I used another card base from SVG Cutting Files along with Star Dies, Flag Dies 2, Candy Wars and Tropical Dies from Jaded Blossom! Thanks for checking out the hop today!! It is 24 hours only so make sure to complete it and then click the image below to download the free files! I love your cards! I was totally not expecting a Jedi Mickey! Very cute. Love the Jedi Mickey! woo hoo! awesome hop, awesome creations, thanks again. Love, love, love Jedi Mickey! Both of these are so cute! Can't wait to see the new droid! I absolutely love Jedi Mickey! Love, love, love! These are both really great! Thanks so much for sharing! Two for one.. you are amazing! Great Job on every thing, thank you! Wow - love both projects - Jedi Mickey is just too cool!! 2 Awesome projects, Love them both! Love both of these cards! They're awesome! Great job, and what a wonderful surprise to see Jedi Mickey! ty! Mickey Mouse Jedi I love it. I think this is one of my favorite Mickeys of all time! These are awesome....love R2D2 and the Mickey take on it was cool. Thank you for a fabulous hop! Aww, I love that little Star Wars Mickey!! These cards are awesome, but c'mon! Jedi Mickey?!? Love It!! Thanks so much!! I just screamed! I love it! Love both your projects, but Jedi Mickey..Great! Thank you for sharing. I love both of these!!! Super fun! Love both of these cards. Love both your cards - a wonderful hop as usual! Thanks! I need to make these! Love the Mickey! love your cards, especially Mickey. Thank you for sharing. Have a great craft day. This is awesome! My boys would love this! Cute! Cute! Cute! Thank you for sharing! I love everything about both of these projects, but the Mickey rocks. May the Force be always with you!! Love Mickey!! Hoping to go to starwars weekend one day. WHAT GREAT PROJECTS AND WHAT A GREAT HOP!!!! Love the cuts! and the beep boop beep.. Stamp! Love your projects. Especially Mickey. Oh my, great Jedi Mickey!! I love these, especially the jedi mickey! Awesome! Love the Jedi Mickey Mouse. Great cards I can't wait to see the movie!! Too cute, LOVE the Mickey!!! i love the orange guy! the colors are awesome! You did a great job! These turned our great. Want to make both of these ASAP...maybe the boss hasn't heard of may the fourth...and I can be..cough..cough..sick?? I adore the mickey one! Well done! Haven't seen the new trailer but can't wait! Awesome projects! Yes! So excited to see BB8! Love Jedi Mickey, too! LOOOOOOOOVE Jedi Mickey!!! So cute! JEDI MICKEY! How awesome, love it! Super cute, but I REALLY love the Mickey! Haven't seen the new trailer, but love your Jedi Mickey! Love! The Mickey is my favorite! Thank you! Absolutely love your projects! Thanks to everyone for sharing your amazing projects! Love BB8! And I have pics with Jedi Mickey so this is perfect! Nice surprise at the end! Love Jedi Mickey and the new character too. Yeah, Jedi Mickey! I met him! Thank you. Great projects. Loved this blog hop! great finish to a great hop! thanks for the wonderful inspiration! Too darn cute. Love both your cards. Love these so much. Jedi Mickey could not be cuter!! Thanks so much!! Can't wait for the new movies! Thanks for all the ideas today! AWESOME projects, amazing blog hop as usual! Your projects are amazing! Once again you all did an outstanding job!! Love. love Jedi Mickey! Thanks for all the fun idea's! I can't wait for the new movie! Love the projects! Love Jedi Mickey! But also BB8 because he is unique and I love "not so common" designs :) Great job! 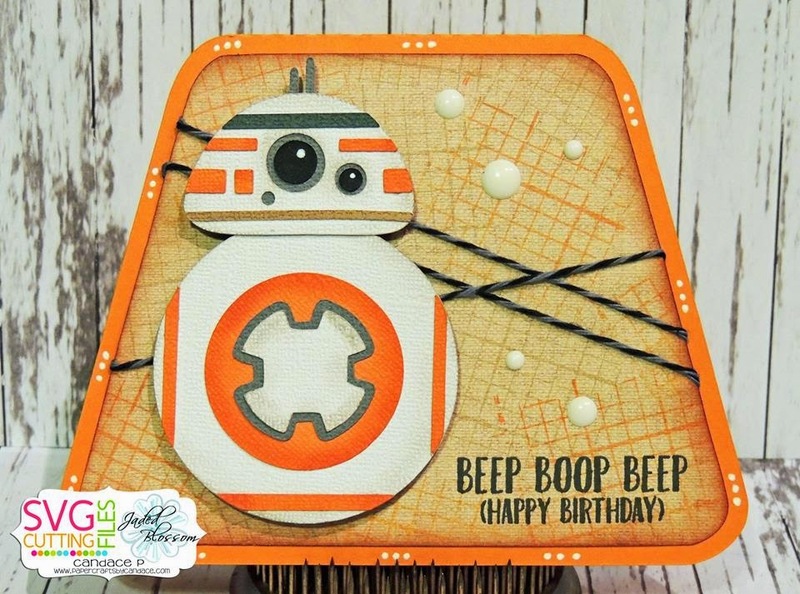 Love your paper and embellishments on the BB8 card. Awesome projects - Jedi Mickey is Super Cool! Such super projects! That Mickey is just too cute! Love the sentiments with both too!